Peter Bence, an incredible Guinness World Record-breaking pianist with the fastest fingers on the planet showed stunning technique and speed of performance to the Baku audience. 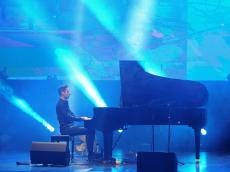 World-famous pianist gave a concert at Baku Congress Center on November 24, Trend Life reported. The musician stunned the listeners with "Awesome Piano" solo program. A few hours before the concept, Hungarian composer and virtuoso pianist attended the press conference. The musician said that this is his first visit to the capital of Azerbaijan. Peter Bence noted that he tried Azerbaijani national dishes and really enjoyed them. The musician stressed that in the future he would gladly hold a master class in Azerbaijan. Following the question of the journalists whether the musician intends to break through his record during his performance in Baku, Peter Bence replied that he did not think about it and for him the main thing is the quality of performance. Tar was presented to the Hungarian pianist by the Honored Artist of Azerbaijan, tar player Shahriyar Imanov. After the press conference, the pianist captured the audience in Baku with his ease of performance. Along with his musical compositions, Peter Bence also brilliantly performed the works of world renowned musicians. Notably, Hungarian pianist is listed in the Guinness Book of Records as a pianist record holder for the speed of a repeated key press (765 notes per minute). He has taken the Internet by storm with his piano arrangements of Michael Jackson, Queen and Sia gathering over 300 million video hits and a huge following on YouTube and Facebook over the past two years. He has achieved sensational success with his edgy, percussive and expressive playing style that has broken down boundaries between classical and popular music. He takes the piano to a whole new level, which inspires both younger and older generations of musicians and music lovers from everywhere around the world. When he was two years old, he already played back melodies by ear from his favorite cartoons and films on his grandparents’ upright piano. Showing serious interest and talent, he soon began his musical education at 4 in the local music school of his hometown, Hajduboszormeny in Hungary. Peter Bence was considered a musical prodigy by teachers and peers, and was already accepted at Franz Liszt University of Music in Debrecen, despite he was still being enrolled at elementary school. At seven he wrote his first composition, which was heavily influenced by the music of Mozart and Chopin, and at 11 he published his first solo piano album of his early compositions. After his training in classical piano and composition in Hungary, he continued his studies as a scholar at Berklee College of Music in the United States as a film scoring and piano major. Even though he was taking in every genre of music possible, he found his biggest influence in Michael Jackson. Peter began uploading videos to YouTube while at Berklee and in 2015 with his arrangement of Michael Jackson’s ‘Bad’ he quickly rose to fame, collecting a whopping 10 million hits over just a few days, becoming a massive viral sensation. He has performed for tens of thousands throughout 20 countries, opened BBC’s Proms In The Park 2017, in Hyde Park, London for 50,000 people, and was featured the Ellen DeGeneres Show’s website, BBC, Buzzfeed, 9GAG, Classic FM, iHeart Radio or Billboard.